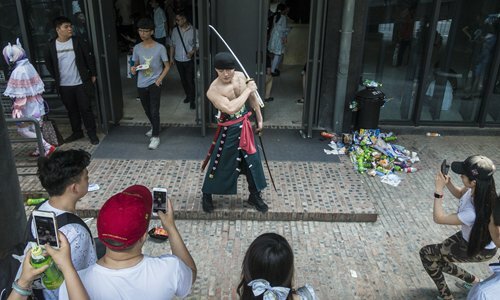 A group of Chinese enthusiasts of Japanese anime have found themselves caught up in a legal conundrum for translating Japanese manga and video games for Chinese fans. Though members of the group do this for free out of their devotion to Japanese cultural products, Japan's government agencies estimate their deeds have resulted in billions of dollars in losses to the industry. The online translating group, called hanhuazu (fansub group), provided free subtitle translations for entertainment products of other languages into Chinese. On January 30, Hu Zhenting (pseudonym), who has worked in Japan for more than three years, was awakened suddenly by a knock on his door. He saw more than a dozen policemen outside, causing him to break into a cold sweat. He did not know he would lose 21 days of personal freedom with a 1 million yen ($9,000) of fine simply for being accused of "translating an article of Japanese well-known game magazine Den-fami Nico." Hu was one of five Chinese youngsters in their 20s arrested over violations of copyrighted Japanese manga and video game content after translating and distributing them online without any authorization from the producers. Police departments in Kyoto, Yamaguchi, Shizuoka, Mie and Shimane prefectures prepared for two months to lead the arrest in a joint operation. The Japanese Agency for Cultural Affairs in 2013 estimated that the industry suffered a loss of 3.8 trillion yen per year involving the copyright infringement of comics, cartoons and games released on the Chinese internet sites. This was the second time Chinese translators were nabbed by Japanese police for copyright infringement. In 2015, Kyoto Prefectural Police arrested three Chinese nationals on charges of copyright infringement for allegedly releasing a scanned chapter of Eiichiro Oda's One Piece manga to an English pirate website. The site reportedly gathered 4,000 pieces of illegal manga without specifying how many of them were Chinese contributed. Japan has a complete and severe legal net for copyright protection. Hu Zhenting's arrest came after a report from a gaming company in Tokyo, which says that an organization had cracked and translated their games. They asked for police investigation. If convicted, the suspects may possibly face up to 10 years in jail, with up to 10 million yen in fines, and additional lawsuits from the publishers or creators, more severe than the punishment for public indecency or trespassing, given Japan's emphasis on copyright protection. Hu was found not a member of the group and was given leniency. Media reports say that the Japanese police have initiated a campaign against Chinese "pirates" once a year since 2015. Southern Weekly, based in South China's Guangdong Province, reported that the Japanese departments believed that the fansub group has hurt the Japanese national cultural strategy known as "Cool Japan." Cool Japan was an initiative developed by Japan's Ministry of Economy, Trade, and Industry with a core purpose of promoting its domestic "creative industry." "There was a guy colluding with staff at a printing house and releasing the latest manga from the Weekly Shonen Jump anthology to Chinese translators before its official publishing. It turned out to be widely distributed among Chinese fans first, while Japanese fans were left behind. It is surely damaging for Japanese cultural industry," MU-Chan (pseudonym), an early fansub group member working in Japan, told the Global Times. However, the group is argued to have taken much of the credit for popularizing Japanese culture in China's market. Some are worried that cracking down on Chinese fans might lead to a chilling effect on Japanese intellectual products. The Japanese police found that the group's members were mostly Chinese students in Japan and people who love Japanese pop culture. Taking Hu as an example, all his language learning efforts came from his enthusiasm of Japanese culture. 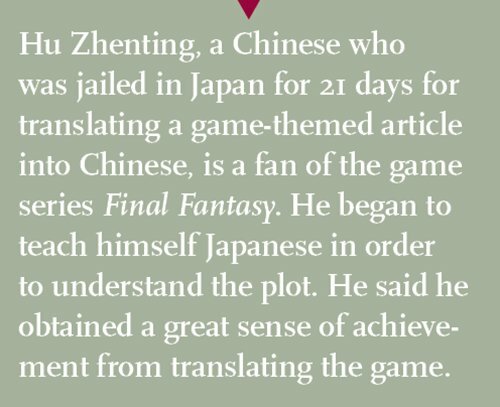 He is a fan of the game series Final Fantasy, and began to teach himself Japanese in order to understand the plot. He said he obtained a great sense of achievement from translating the game. Despite being Hu's jailer, the Japanese police, many of whom are gamers and anime fans themselves, spent a lot of time casually chatting with Hu about his favorite game Monster Hunter, a fantasy-themed Japanese video game. "If more translators viewed translating as a risky thing, less people would do it. It could strongly affect the way the fan community goes," a net user posted on the forum. On Japanese online forum Novel Updates, some ordinary Japanese who heard of the group for the first time quickly connected it with the profit-driven piracy dealers. They feel it is hard to understand their "voluntary nature," questioning what makes them keep going with such a high risk if not for profit. But it cannot represent the ambivalence of Japanese citizen's about the fansub group. "Being a fansub does not mean getting involved in piracy," said MU-Chan. Although they themselves don't make money out of the translations, their work profits unscrupulous pirates, he said, saying that's where their guilt comes from. "Once in a large bookshop in China, I saw the legitimate version and the pirated version of an anime I translated put together for sale. I never meant to participate in piracy, but you can imagine how helpless I am when facing the copyright infringement because the copyright never belongs to me," he said. "Whether we are accomplices or victims, people will judge by themselves." Though Hu Zhenting was later confirmed to be not part of any fansub organization, he said he felt that there is little space left for the fansub group. "Their self-interest cannot compensate for the risk of law. In the global wave of copyright protection, it is time to review the situation," Hu posted on his Sina Weibo. The Chinese government has initiated stricter examinations in recent years. The State Administration of Press, Publication, Radio, Film and Television of China issued the Notice on Enhancing Regulations of Reality Shows in 2015 to appeal for original creativity in the Chinese entertainment industry, declaring to suppress copyright infringement behaviors. Bilibili, a hugely popular site among Chinese millennials, which was originally a place to watch Japanese anime and other such niche shows, cleared up the suspected infringed programs in 2017 to submit to relevant laws and regulations. In January, the National Assembly of South Korea, the country's top legislative body, passed the Content Industry Promotion Act and the Music Industry Promotion Act, offering legal grounds to protect intellectual property from indiscriminate plagiarism in foreign countries. A lot of people applaud South Korea's heavier scrutiny over program makers, claiming that the China's creative industry and entertainment would benefit from Korea's new laws, given the thought that rampant plagiarism would finally mutilate China's creative gene. "This fully demonstrates that copyright protection has become an international consensus," Zhao Zhanling, the senior researcher of Center for IPR Studies, China University of Political Science and Law, told the Global Times. "It helps the Chinese cultural and entertainment industry to accelerate its independent development and promote originality." "In our country, the lack of good original cultural products and negligence of copyright awareness are caught in a vicious circle. As the cost of breaking the law is very low, plagiarism is prevailing around the market," said him. "With China's expansion of opening-up to the outside world, we are expected to provide a perfect protection mechanism for all of imported cultural products," commented Zhao.